From barn raising to Wikipedia, from humble gestures of giving in our closest circles to the masses of volunteers who follow inspirational leaders like Gandhi to transform the notion of human dignity for all of us, “voluntary action for the public good” shapes who we are and the world around us. It is a power we are beginning to understand better and to use more deliberately. But, you may say, economists, historians, psychologists, and even business professors already research and teach about philanthropy. And these standard disciplines are better established—we expect to see them on résumés. Why does philanthropy need its own field? First, because it opens a new way of achieving a meaningful and relevant liberal education. Second, because it prepares public-minded professionals to master the knowledge needed to guide individuals, communities and organizations in harnessing the power of giving. Third, because it nurtures the interdisciplinary curiosity needed to add to the body of knowledge about the role of philanthropy in our world. Educators and CEOs laud the benefits of a liberal education at the same time that job anxiety and hype about the perils of student loans lead students and families to underinvest in a liberal education that will prepare them to become nimble learners and curators of their own careers. And many of our traditional liberal arts disciplines that remain the core of the university feel themselves under siege. A philanthropic lens allows students to rediscover the wealth of disciplinary perspectives and craft a sense of self and the world that will serve them well throughout their lives. As the job market shows, there is strong demand for talent that can engage the voluntary energy that powers communities to improve how we live. As we seek to master a craft that defines our profession, there is one essential ingredient that is impossible to automate and mass produce—community. From correspondence courses delivered by pony express to radio and television’s promise to quickly educate the masses, we are now exploring the potential for personalized machine learning to interactively deliver content into our brains. It is inspiring to imagine future children becoming multilingual by playing video games, but we will continue to need a community to cultivate our scholars and to enable our students to engage each other around a table, even if it is a virtual one. As long as we seek to instill mastery in the full range of perspectives one needs to serve as a faithful guide for the conduct of philanthropy, the role of the student will need to be as immersive as that of an apprentice. Progressing from mastery to discovery we enter the challenging domain of interdisciplinary research where our future knowledge lies. Unfortunately the disciplinary vessels we keep reproducing may not be well suited to getting us there. Philanthropy has jumped ship and decided that a variety of methods need to be applied to generate new knowledge. This requires our pioneers to both master the way several disciplines work and to find coherent ways of integrating them. The three reasons for philanthropy as a field of study naturally reflect the process of education at the bachelor’s, master’s and doctoral levels. To have a viable field of study it is important to have progress on all three levels and that they usefully inform each other as they move forward. New knowledge produced by Ph.D.’s will help bachelor’s and master’s students enhance their appreciation of the philanthropic spirit and improve the work that they do in advancing it. 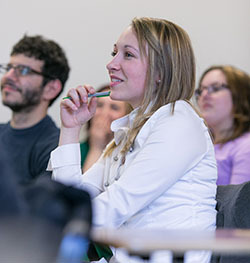 By studying the work of the bachelor’s and master’s alumni, doctoral students can seek to improve understandings of the practice in the field. Bachelor’s and master’s students can learn from each other to establish the inter-generational transfer of knowledge and responsibility that drives progress. Beyond the intellectual integrity of each level of education in philanthropy, there is a great advantage in having them side-by-side in one school so the full cycle of discovery, mastery and preparation can enjoy the creative advantages of sharing a community. The Lilly Family School of Philanthropy aspires to be the intellectual home for that community, and for all who are serious about philanthropy. I hope you will join us. Now you can earn your master’s degree from the world’s first school of philanthropy wherever you are. You receive the same degree and learn from the same faculty as you would in our on-campus classes, from anywhere in the world. 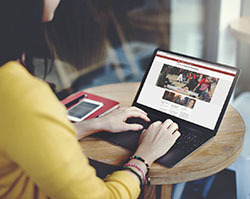 Whether you’re an experienced nonprofit professional or you’ve just completed your undergraduate degree, the idea of starting a master’s degree program might seem overwhelming, but completing classes online makes it manageable for those who work full time, or who don’t live in the Indianapolis area. Our online option ensures the same quality, but offers more flexibility. The Master of Arts in Philanthropic Studies is the first degree program in the world to focus on the history, culture, and values of philanthropy. You’ll be taught to understand the social, cultural, political, and economic factors that affect and are affected by philanthropy and nonprofit organizations and gain a deeper understanding of the field to further your career goals and your organization's mission. Check out our master’s program and choose the option that works best for you. After completing a financial degree in his native United Kingdom, Callum Stewart traveled to the States to coach high school soccer, but his purpose here quickly changed. 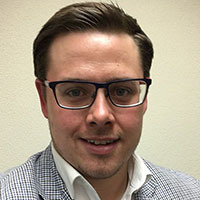 During his time coaching, he expanded his connections in the nonprofit sector, and earned a position as associate director of personal giving at Trinity University in San Antonio, TX. At Trinity, he was able to raise scholarship funds for students, something he finds immensely important, since he received his financial degree with the help of scholarships. Stewart chose to pursue a master’s degree with the Indiana University Lilly Family School of Philanthropy because of the flexibility of the schedule and the prestige of the school; he believes the school offers the best philanthropy degree in the world, and says that enrolling in philanthropic studies allowed him to improve his fundraising skills. Because of the online course flexibility, he was able to work full time while earning his master’s degree. His favorite professor is Debra Mesch, director of the Women's Philanthropy Institute. Mesch’s class allows him to explore the importance of women's impact on philanthropy. Today, Stewart is associate director of development for the School of Global and International Studies at Indiana University, and he encourages other U.S. and international students to pursue their degrees and complete an internship. He’s an advocate because internships allow students to utilize the content learned in class to solve a real-world problem, accumulate work experience, and make connections with others. In a world where diverse faith communities interact with great frequency and intensity, how can we both preserve the particularities of our distinct faith traditions while promoting positive interfaith cooperation? 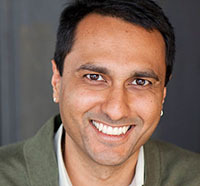 Dr. Eboo Patel, founder and president of Interfaith Youth Core and author of Interfaith Leadership, Acts of Faith, and Sacred Ground will deliver the 2017 Thomas H. Lecture, presented by Lake Institute on Faith & Giving at the Lilly Family School of Philanthropy. In his remarks, “Building a Diverse Democracy: Exploring the Theologies and Practice of Interfaith Cooperation,” Patel will challenge us to consider the theologies of interfaith cooperation that exist within our own traditions and how cultivating these theologies can both deepen our own faith and improve relationships across faith communities in a way that strengthens our civil society. Local community organization Flanner House received $10,000 for its Farming, Education, Employment, Distribution (F.E.E.D.) program, a grant from the fall 2016 Learning by Giving class at the Lilly Family School of Philanthropy. The F.E.E.D. 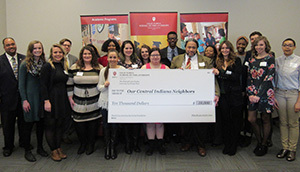 program will use the funds to create an urban garden and farming program that will provide local residents who live in Indianapolis' largest food desert with access to healthy foods, education, and training in agriculture and food preparation and delivery, and employment placement support. In the hands-on Learning by Giving course, students learn and implement the process of giving responsibly and make grants, from deciding which community issues to address and writing requests for proposals to conducting site visits at nonprofits, evaluating applications, and deciding where to award the money.